This weekend was unseasonably warm in NYC. On Sunday we hit the 70's, which made our holiday weekend in the city extremely pleasurable. On Saturday we had a girls night out, and did a little dinning and shopping at the American Girl store, (more on that later). Then we walked over to the Rockefeller Tree to officially ring in the holiday season with the family. I took a few snaps on Instagram if you would like to see. On Sunday we attended a kids birthday party, but it felt so weird to not wear a jacket this time of year!! I was almost confused on what to wear! (Ha!) 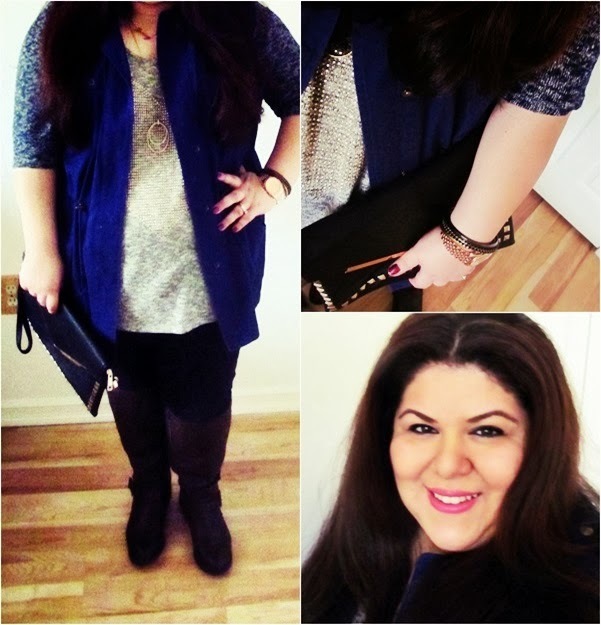 So I opted to go comfy and cozy in a heart studded sweater top, utility vest, leggings, and boots. Perfect outfit to chase little kiddies in, don't you think?